Eastern screech-owl, photographed at Green Cay Nature Center, Boynton Beach, Palm Beach County, in March 2016. The soft trill of the eastern screech-owl, Megascops asio, is often heard but the bird itself is seldom seen. That's mostly because it is a creature of the night. But it's also because of its habitat — It's a bird of the forest — and because of a color mix of reds, browns, grays, which allows it to blend in perfectly with its surroundings. The eastern screech-owl is a tiny, compact raptor, ranging between six and 10 inches long, with a wingspan that reaches two feet at most. It is the smallest of the owls found in Florida. Males are smaller than the ladies of the species, which is actually something of an advantage while hunting through woods. It's found throughout the United States east of the Rockies, including Florida. Its range also touches southern Canada and northern Mexico. It is a nonmigratory bird throughout its range. The key to its presence: trees. In Florida, three "morphs" are found, gray, red and brown, with red and brown being more common than the gray. 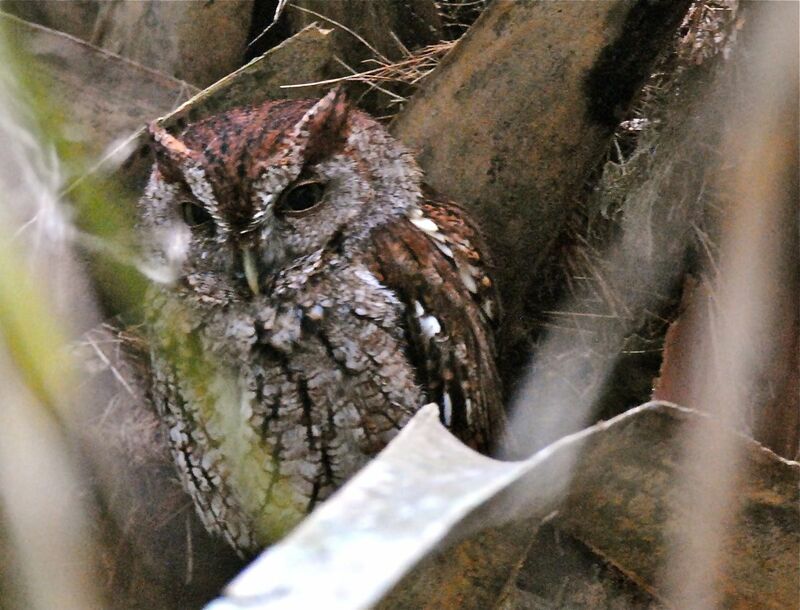 Eastern screech-owls can be found in all kinds of woods but usually with an open understory and near water. They generally hunt from a perch with a clear path to the ground, sitting, waiting for a juicy morsel to wander by. That morsel could be a rat, rabbit, blue jay, dove, or any number of small mammals and songbirds. It could even be an earthworm or bug, lizard, frog or fish. Occasionally it will take bugs and bats on the fly. In flush times, eastern screech-owls will store as much as four days worth of food in tree holes. They nest in tree cavities, but they don't carve out their own. Eastern screech owls also readily take to nest boxes. It will find an opening; if it's been used before by another bird, a woodpecker for example, the female will form the debris into a cup to fit her body and her eggs. In any case, she will not add nesting material. Eastern screech-owls are mostly monogamous, but occasionally males will have something going with a second female within his territory. Clutches are two to six eggs that incubate for four or five weeks. The offspring remain in the nest roughly a month afterwards. During this time, the female remains with the nest, with the male providing all the food for both his mate and hatchlings. The young owls remain with their parents for about two months after fledging. Breeding season in Florida is March to May. 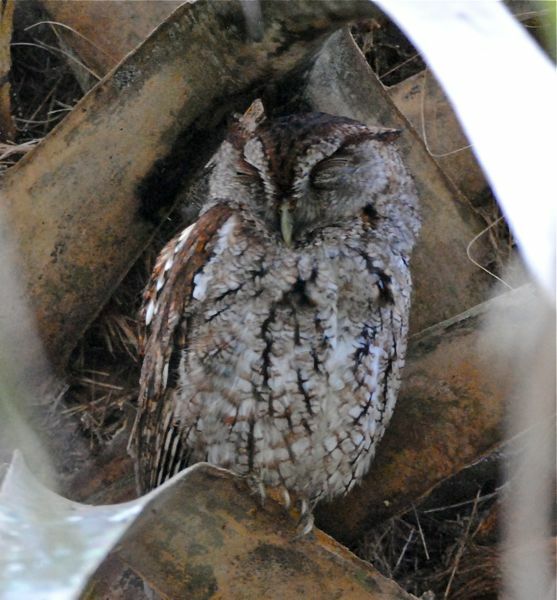 Eastern screech-owls have one brood per season, but there is some evidence that some pairs in Florida have a second family. 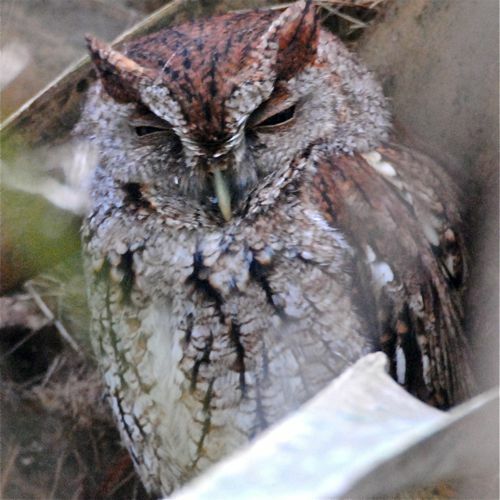 Eastern screech-owls remain common birds throughout their range, in deep woods, in the 'burbs, in your backyard. They are highly adaptable to human-altered environments, but there is some evidence of a slight decline in numbers. In any regard, extinction isn't a threat at this point. A taxonomic note: we've seen references to Otus asio as the scientific name for the eastern screech-owl. It is a member of Strigidae, the family of true owls.